A given explosive mixture has two limiting burning rates; the lower limit of a molecular diffusion controlled laminar flame and the upper limit of Chapman-Jouguet detonation. Experiments indicate that nature always tends to maximize the burning rate under the constraints imposed by the initial and boundary conditions. Between the two limiting cases, the burning rate or the effective flame speed is a continuous spectrum. Turbulence plays the universal role in determining the burning rate that spans the three orders of magnitude from laminar flame (δ ≃ 0.5 m/s) to Chapman-Jouguet detonations (VCJ ≃ 1800 m/s). Weak turbulent flames are essentially laminar flames in which turbulence increases the burning surface area and hence the burning rate or effective burning velocity. 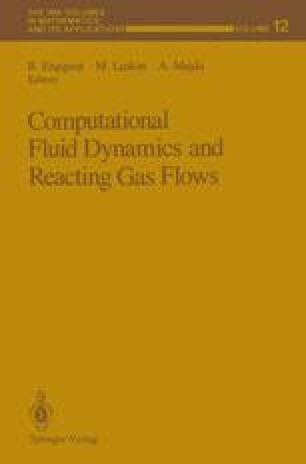 The flame surface being a density interface is subjected to dynamics and diffusive instabilities and interface instability mechanisms become important as the turbulent intensity increases. The instability mechanisms play important roles in the break-up of the flame surface and control the fine structure and hence the details of the mixing and reaction processes. Shock waves become important for even higher levels of turbulence. Apart from inducing interface instability (Rayleigh-Taylor, etc. ), creation of vortex structures, adiabatic heating of the mixtures, shock wave Mach interactions also produce shear layers and subsequent turbulence via Kelvin-Helmholtz instability. Boundary conditions control the effectiveness of the various mechanisms and it appears that there is no sharp distinction between high speed turbulence deflagrations and detonations. The lecture emphasizes the need to develop models to describe the mechanisms correctly and investigate the cooperative effects among themselves.